These mittens won’t warm chilled hands, but they will generate good cheer when used at your wedding. This idea comes from my favorite place on the web, Martha Stewart.com. Use these mittens as a name card holder to give a festive feel to a holiday wedding. Another option is using these mittens to hold your donation cards if you are donating money to a charity instead of favors. All you have to do is cut a mitten shape from cardboard, and trace it onto a piece of felt. Cut along the lines, and glue the felt to the cardboard with clear-drying white craft glue. Adorn the felt side of the mitten with bits of felt in complementary colors — dots made with a hole punch, a monogram, felt trim edged with decorative shears, or a Christmas tree cut out with a decorative craft punch. Glue a standard wooden clothespin to cardboard, then glue a magnet to the back of the clothespin. 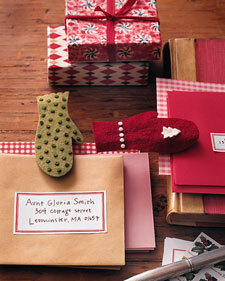 After the gifts have been opened, use your mittens to display greeting cards on the refrigerator.